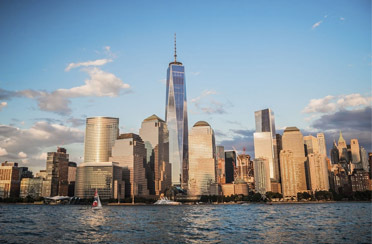 Step aboard the Manhattan II and back in time with the 1930s-inspired French-style Gypsy Jazz as you witness the city’s beauty and elegance from the water. Guitarist Alex Simon & his trio perform the musical stylings of Django Reinhardt with dazzling technique and lyrical impressionism. It is a bright but elegant style of acoustic swing that evokes the vibrancy of cosmopolitan life and the folkloric sounds of rural Europe, originating in France. On this cruise you may hear a combination of 1930s French Swing as well as Louis Armstrong hits. Alex Simon has performed at The Guggenheim, B.B. King’s Main Stage, The Rainbow Room, as well as world-renowned cocktail lounges such as Milk & Honey, Bathtub Gin, NoMad, The Roxy, and many other of New York City’s finest venues. 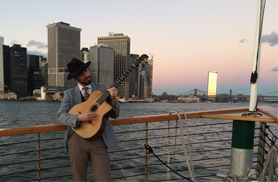 Step aboard the *Manhattan* or *Manhattan II* and witness the city’s beauty and elegance, while enjoying some festive Gypsy Jazz with guitarist Alex Simon & his trio. Enjoy music of Django Reinhardt with dazzling technique and lyrical impressionism. This music is a bright but elegant style of acoustic swing that evokes the vibrancy of cosmopolitan life and the folkloric sounds of rural Europe, originating in France. Cruise New York City’s famous harbor aboard the 1920s-style yacht *Manhattan* or *Manhattan II* while listening to this fabulous trio. On this cruise you may hear a combination of 1930’s French Swing and Louis Armstrong hits. Alex Simon has performed at The Guggenheim, B.B. King’s Main Stage, The Rainbow Room, as well as world-renowned cocktail lounges Milk & Honey, Bathtub Gin, NoMad, The Roxy, and many other of New York City’s finest venues.